unpredictable moments, like a gutting knife made of colored light. 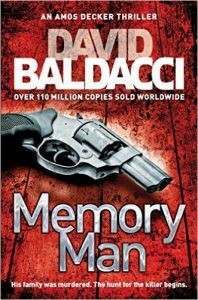 Memory Man by David Baldacci will stay with you long after the turn of the final page. David Baldacci is the author of eighteen previous New York Times bestsellers. With his books published in over 45 languages and with nearly 90 million copies in print, he is one of the world's favourite storytellers. David Baldacci is also the co-founder, along with his wife, of the Wish You Well Foundation, a non-profit organization dedicated to supporting literacy efforts across America. Still a resident of his native Virginia, he invites you to visit him at www.DavidBaldacci.com, and his foundation at www.WishYouWellFoundation.org, and to look into its programme to spread books across America at www.FeedingBodyandMind.com.